On December 11, President Trump, Vice President Pence, House Minority Leader Nancy Pelosi, and Senate Minority Leader Chuck Schumer met for a photo-op in the Oval Office. What was intended as a gesture of goodwill in front of the press quickly dissolved into a public spectacle of bitter argument between the two sides. The futility of this meeting and its photo op is brought into sharp relief by the current government shutdown, the longest in US history. At the meeting, Trump stubbornly demanded 5 billion dollars for his wall and even offered to take responsibility for the subsequent government shutdown. Schumer insisted that the Democrats wanted to avoid a shutdown. He aggressively disputed Trump’s claims about the wall’s cost and current state of development, at one point equating Trump to Pinocchio. Pelosi attempted to act as moderator for the debate, insisting multiple times that they should avoid having a “debate in front of the press,” though she still managed some swings of her own. Pelosi challenged Trump to bring the wall to a vote in the House of Representatives to test his claim that he had enough votes to get it passed, saying “the fact is that you do not have the votes in the House.” Later in the discussion, Pelosi again questioned the truth behind Trump’s claims, remarking that they are “devoid, frankly, of fact.” The Vice President’s participation in the discussion was completely nonexistent, as if he were simply not present in the room. Why discuss this meeting, or more aptly, melt-down, when the government shutdown has already occurred? This conversation between three of the most powerful people in the US is important not merely for its content, but for its context: an argument over facts and policy in a setting that is designed for getting along in front of the press. One of the most memorable moments of the conversation came near the end, after the subject drifted from border wall to wins and losses in the midterm elections and the power dynamic of the divided government. “Let me say this, this is the most unfortunate thing. 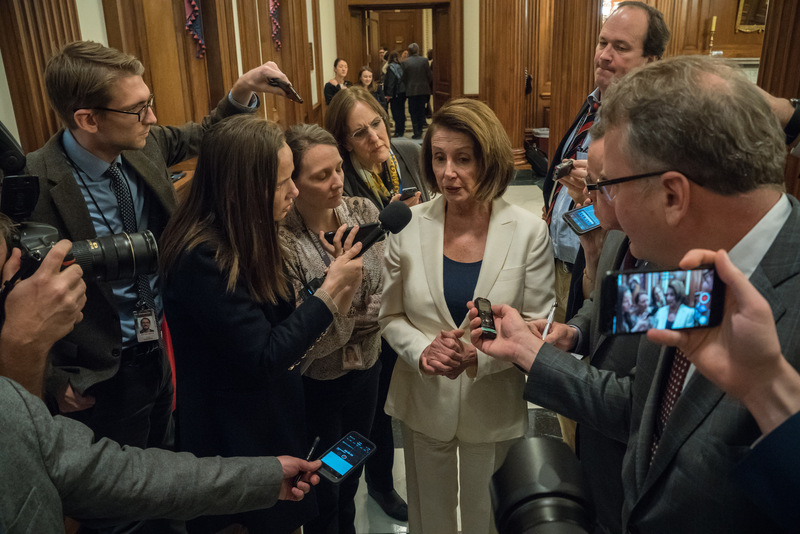 We came in here in good faith, and we’re entering into a — this kind of a discussion in the public view,” Pelosi insisted, again trying to end the vicious argument and bring them back to a more photo-op appropriate tone. “But it’s not bad, Nancy. It’s called transparency,” Trump replied. He’s not wrong. It is good for citizens to see their political leaders debate in the public view. However, Pelosi was also correct when she replied “it’s not transparency when we’re not stipulating with a set of facts.” This wasn’t a debate, because the two sides were not on even footing and they were not working with the same facts. Watching the video of Trump, Schumer and Pelosi squabble in the oval office is fascinating but painful. It’s a bit like being invited to a friend’s Thanksgiving Dinner, sitting down to eat and realizing that their whole family hates one another. Four people sit down to play nice but they just can’t hold it together. Who doesn’t like to watch other people argue? However, the spectacle of watching one of the most powerful governments in the world squabble on live television should not trivialize the concrete effects of the government shutdown. 800,000 government employees are either furloughed or working without pay. FDA food inspections have been greatly reduced. Trump’s top economists have admitted that the shutdown could result in zero economic growth for the first quarter of the fiscal year. The shutdown that was being thrown around as a negotiation tool in Trump, Schumer, and Pelosi’s argument is now having drastic effects on the American people and the country as a whole. Watching the public argument between several of the United States’ most important politicians is particularly shocking because public, face-to-face disagreement between American politicians rarely happens. Despite, or perhaps because American politics is so polarized, direct engagement between politicians is rare. Outside of the strictly regulated debates held during elections, politicians generally communicate through press releases, tweets, and rarely watched congressional speeches. The problem with this is that it allows two different parties to have two entirely different conversations. It allows them to work with different facts. Direct confrontation is sorely lacking in American politics. Trump was right, public debate is not bad. It is transparency and it strengthens democracy. The United States would benefit greatly from an equivalent to the system of question time in the UK and Canada, which allows politicians from the minority party to question and criticize the majority party in a live broadcast. Direct confrontation would force the two parties to participate in the same conversation. However, this photo op was neither the time nor the place for an American “question time.” The purpose of this photo op was meant to show two sides working together to avoid a government shutdown. A squabble made the two sides look incapable of getting along, and did not bode well for the next two years of divided government. The fact that not long after this goodwill meeting the government shutdown actually happened is deeply demonstrative of this fact. The nature of this meeting also meant that if Pelosi aggressively rebutted Trump’s claims about the cost and necessity of the wall, she would look like a poor team player. The United States does need public debate. However, it needs public debate in a forum specifically designed for debate, a forum with fact checkers and the expectation that each side will not hold back, and that when the debate is over the government will go back to trying to work together and for the American people. Just as it needs public debate, the United States also needs a President that knows when to put aside his own vanity projects for the good of the American people as a whole. The government, if not working together, ought to at least be working. Featured image by Julio Obscura, via Flickr Creative Commons.